Eye on Asia: An Ode To Excellence! It’s out! The February 2019 edition of ASIAN GOLF and it is loaded with top tier editorial content on a full range of golf-related news! 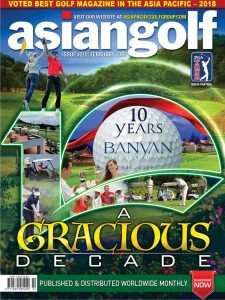 The cover story pays special tribute to one of Asia’s top golf clubs, the Banyan Golf Club in the Thai Royal Kingdom of Hua Hin. The club celebrates a very special milestone in its history – its 10th Anniversary! In that time, Banyan Golf Club has strived hard to set very high standards right across its operations. This has been validated over the last ten years by the club’s numerous successes at the prestigious Asian Golf Awards, the yardstick by which golf clubs are measured on the Continent. The focus is on the club and its magnificent team. The February edition also provides insightful reviews on a range of new golf equipment starting with PING’s highly revolutionary drivers and impressive offerings from Callaway, Wilson Staff, Titleist, TaylorMade amongst others. Get up to speed on all the new gear that will be hitting stores Asia-wide this month. Our resident golf guru, Tony Meechai makes a return after a three-month hiatus and he is back with some really useful tips that will give help set your game on fire. For this and more, check out the February 2019 edition of ASIAN GOLF. There’s nothing like ASIAN GOLF! Stay with ASIAN GOLF for the best perspective on golf – regional, international and global. It doesn’t get any better! Welcome To The Exciting World Of Asia Pacific Golf!